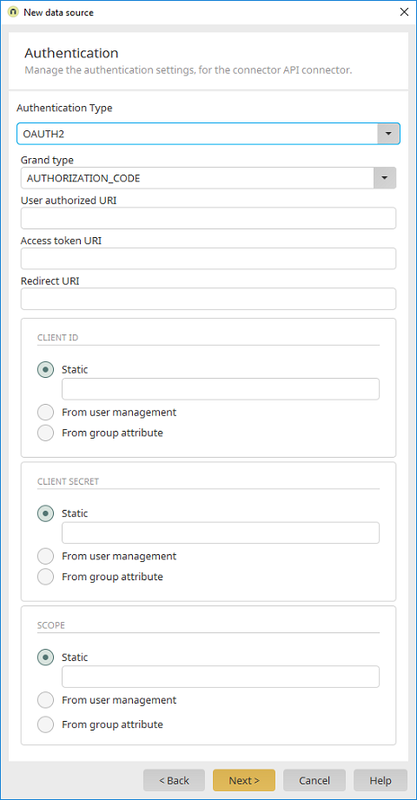 Integration module Consume data Connector for Connector API "Connector API" menu / New data source General information / Continue to "Authentication"
Select the desired type of authentication. If "OAUTH2" is selected, additional settings are available in this dialog. These are described below. Currently, only the "authorization_code" type is supported. Enter the URI of the authorization server. Enter the URI used to obtain the access token. The redirect URI is made up of the portal URI and "service/oauth2/authorize". Information about the remaining settings is available here.